Most of us are familiar with Jesus' instructions not to judge others. But what exactly did he mean? Are we supposed to look away when a close friend or family member is doing something dishonest or immoral? Are there times when it is wrong not to judge? In this 4-part series, Andy Stanley tackles this confusing and often misunderstood topic. We learn the steps to take before confronting others and how to react when someone judges us. 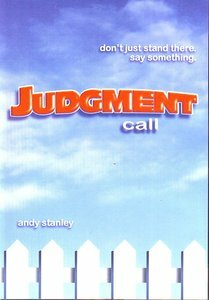 Andy Stanley is a pastor, communicator, author, and the founder of North Point Ministries, Inc. (NPM). Since its inception in 1995, North Point Ministries has grown from one campus to three in the Atlanta area, and has helped plant fourteen strategic partner churches throughout the United States. Each Sunday, over 20,000 adults attend worship services at one of NPM's three campuses, North Point Community Church, Browns Bridge Community Church, and Buckhead Church.